If you’ve ever wondered what it would be like to marry a mashed potato with a crisp hashbrown, this is the recipe that will satisfy your musings. It’s a bit time-consuming because it happens in two steps, but it’s worth the extra minutes if you’ve got them. 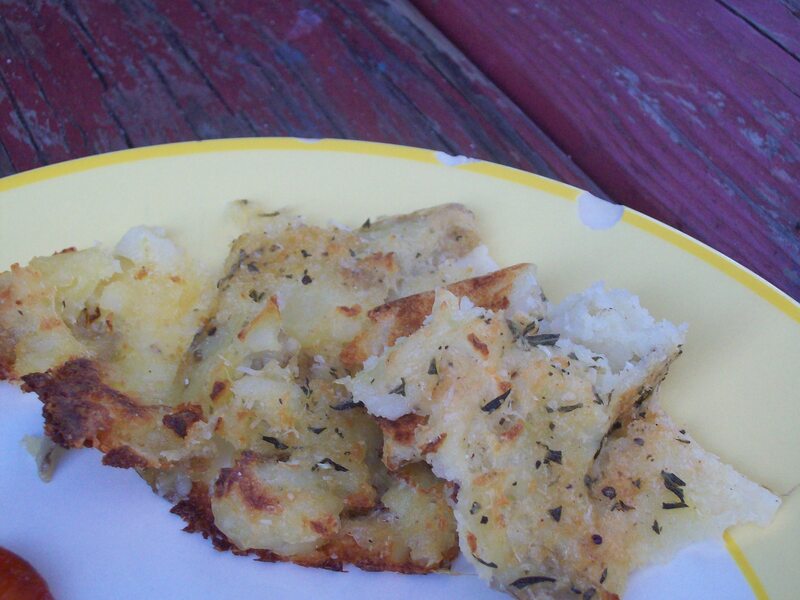 Even my potato-avoiding kid had to admit that these won him over, thanks mainly to the salty, cheesy crust that forms on top. Place the cubed potatoes into a medium saucepan and cover them with cold water. Cover with a tight-fitting lid and bring to a boil over high heat. Reduce the heat and allow the potatoes to boil until they’re fork-tender, about 15-20 minutes. Drain. Season the drained potatoes with salt and pepper and add the yogurt. Using a potato masher or large fork, smash the potatoes with the yogurt just until you have a partly smooth, partly chunky mash and the yogurt is well-incorporated into the potatoes. Grease a rimmed baking sheet with 2 tablespoons of the olive oil. Spread the potato mixture out on the greased sheet in a relatively even layer (it doesn’t have to be perfect! Some peaks and valleys are fine!). Combine the parmesan cheese and rosemary in a small bowl, then sprinkle evenly over the potato. Drizzle the remaining 1 tablespoon of olive oil over the potatoes. Bake the smashed potatoes at 400 degrees for 25-30 minutes, until they’re golden brown and crusty and release easily from the pan with a spatula.